Rejoice, Queen’s Blade fans! Your highly anticipated Nendoroid Melona has been available for pre-order since today. 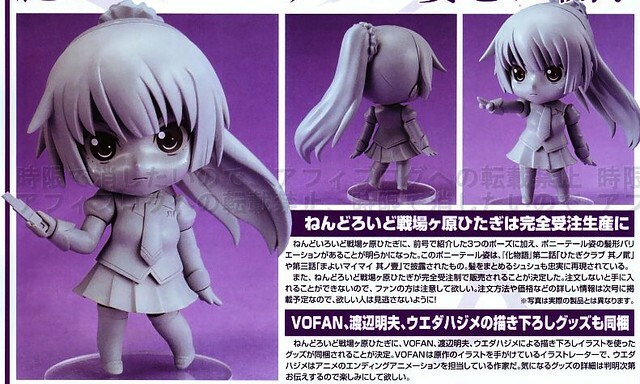 Melona has shapeshifted into … a Nendoroid! From the anime series ‘Queen’s Blade’ comes a Nendoroid of Melona, the shapeshifter and close aide to the Swamp Witch. She comes with a standard smiling expression as well as a winking expression. She also comes with alternate leg parts that allow you to display her with her lower half shifted into slime form, allowing you to enjoy some poses more suited to her ‘Protean Assassin’ title. Similar to other Nendoroids from Queen’s Blade series, Nendoroid Melona will be manufactured by FREEing. She is scheduled for May 2013 release with the usual price tag of 3500 Yen.